The National Association of Disability Practitioners (NADP) is holding an International Conference on 20th-23rd July 2015 entitled “Working for disability equality in Higher Education – the global perspective“. This will be held in Manchester, UK, at the Mercure Manchester Piccadilly Hotel. The University of Manchester (UoM) established its Disabled Staff Network (DSN) in 2006, one of the earliest in the country. From the beginning, the Network was run for and by disabled staff with autonomy and independence. One of the Network’s first achievements was to secure the University’s commitment to provide dedicated support and advice for disabled staff. UoM became the first of its kind to make this commitment, and built upon the excellent services it already provided to disabled students. Since then, the DSN grew from strength to strength, giving it a reputation for being active, supportive and successful. Over the years, the DSN was approached by disabled staff and Equality & Diversity representatives at various organisations in the sector around the UK wishing to learn from their experiences. These enquiries led on to the idea of holding a national event to bring disabled staff together and learn from each other. UoM’s DSN organised and hosted the first ever one-day national conference of the UK’s disabled workforce, on 6th June 2014 in Manchester. The theme of this conference was reflected by its title, “What Are We Hiding?”, focussing on staff with “hidden” disabilities and the “hidden” contributions of disabled staff to the nation’s economy and society. The conference was targeted at disabled people working in higher education, but open to everyone interested. The event was a resounding success, attracting delegates from near and far and from all sectors (public, private, voluntary and social). During the conference workshop on “Disabled Staff Networks”, proposals were presented for a national super-network/association of disabled staff networks as an umbrella organisation to share experiences and good practice, to examine challenges and opportunities, to arrange activities and events, and to represent disabled staff on a national level. All attendees agreed with the proposals and were very keen to be involved. 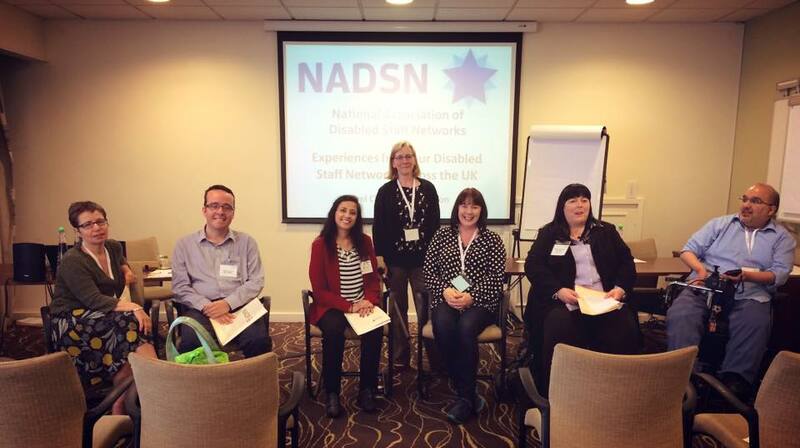 Hence, the National Association of Disabled Staff Networks (NADSN) was launched! Though NADSN is open to all interested organisations, the Association is focused on institutions of higher and further education and their respective disabled staff networks (DSNs). The current membership includes universities, colleges, students’ unions, NHS trusts and authorities, sports bodies, the BBC, charities, etc. Representatives of these organisations, from all corners of the UK, along with representatives of the Equality Challenge Unit and the National Association of Disability Practitioners have formed a Founding Steering Group to establish NADSN and decide its strategy. In this session, an overview of NADSN will be presented. Then a few NADSN members will present case studies of their respective DSNs, reflecting a spectrum of realisation between aspiration and success. This will be followed by a panel discussion on the pros and cons of the approaches and practices of various DSNs. We will explore issues such as disclosure, confidentiality, whether or not to involve non-disabled staff, geographical spread of the organisation, home/distance workers, attendance at meetings and events, engagement of members, inclusion of staff with “invisible” impairments and those on long-term disability-related sick leave, influence on institutional policies and procedures, etc. Linda Robson, Mona Patel and Jacquie Nicholson co-authored a journal article about this workshop, on behalf of NADSN, which is now published in NADP‘s Journal of Inclusive Practice in Further and Higher Education (JIPFHE) 2016, Volume 7, Pages 28-33 (PDF | Word). Many CONGRATULATIONS to Linda, Mona and Jacquie on this awesome achievement!! !